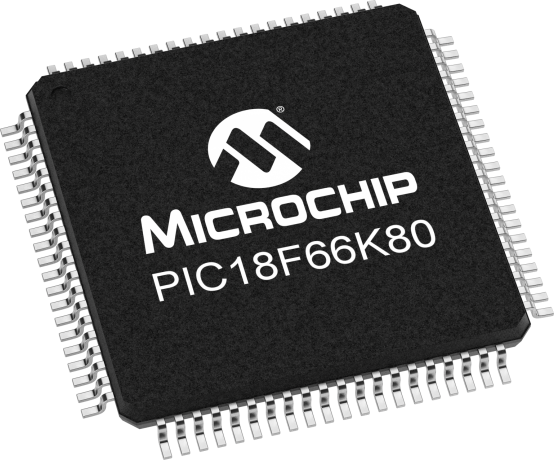 PIC18F66K80 is a high performance 8-bit MCU with Integrated ECAN™ featuring eXtreme Low Power consumption. New features in PIC18F66K80 include low sleep current for low power application, 1.8V to 5.5V operating voltage for automotive, building control, elevator control and industrial application, Timers/Enhanced Compare/Capture/PWMs for precision timing control, 12-bit ADC for advance analog interface and Charge Time Measurement Unit for easy capacitive touch user interface. The PIC18F66K80 family is ideal for applications requiring cost-effective, low-power CAN solutions with high performance and robust peripheral set.